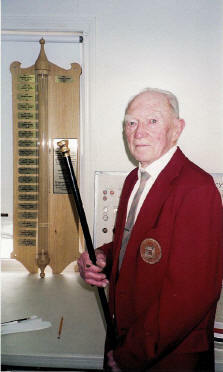 In February 2003, the town of Raymond awarded Ernest (“Ernie”) Harmon Knight with the Boston Post Cane. The cane was presented to the town in 1909 and is traditionally held by the town’s oldest resident. Knight was born in 1905 in Massachusetts. He graduated from MIT in 1928 with a degree in electrical engineering and went to work for Westinghouse. During World War II, Knight served as a major with the 49th Fighter Group in the Pacific. He worked for Boston Edison after returning to the States, but was called back into active duty during the Korean War. After his military discharge, Knight moved his family from Massachusetts to Raymond—the place where his family’s roots were and where he had often vacationed as a child. Knight helped his brother-in-law manage Hartley’s Marina until 1960, when the marina was sold. He then became a math & science teacher and taught at Gould Academy in Bethel, and later at Casco High School. In the early 1970's, Knight was a founding & charter member of the Raymond-Casco Historical Society. He is an avid local historian and the author of several books including Raymond, Then and Now; The Origin and History of Raymond town; Historical Gems of Raymond and Casco; and Guide to the Cumberland and Oxford Canal. Knight’s mother, Mabel, was presented with the same Boston Post Cane in 1959—she held the honor until her death in 1965. The Knights & the Jordans are the only families in Raymond to have two generations awarded the cane.